Some Speak English and Some Don’t: No judgement! Coca Cola aired an ad during the Super Bowl featuring a multicultural group of actors singing American the Beautiful in a variety of languages. Crazy, right? Except more than 25% of Americans can speak another language. Hold on, though! 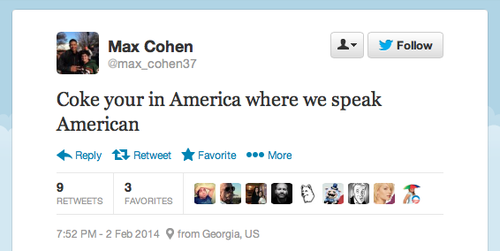 In a tweet from hell, Max schools us all on the official language in these here parts.